I am working on relocating my spa from it's existing "below ground" location, to an above ground deck. Actually, I am replacing the current spa with a newer one, and do not want to encounter the same nightmare situation that I recently did when a pump needed replacement. I have removed the old spa from the hole where the builder had installed it, and would like to build a deck over this hole to support the new one. The hole itself is 12' x 12' square. I would like the deck I am building to be slightly larger at approx. 14' x 14'. I would like the top of the deck to be at a comfortable "one step up" height of approx. 8"-10" above the existing kool-deck surface. I would like to use the composite lumber material available at my local builders supply. The manufacturer of the new spa has stated that the total weight, including the spa, water and occupants, would not exceed 4000 lbs. The shape is octagonal, and is approx. 7' side-to-side. Would a frame constructed from 2 x 8's around the perimeter, and 2 x 6 joists at 16"o.c. be adequate to support this load? 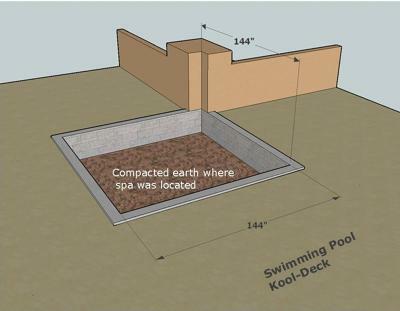 Could this framework be set directly on the pool deck? If not, can you suggest a better design that will be better structurally, while providing the same basic appearance? I have attached a very elementary sketch of the layout I am working with. Thank you very much in advance. I would only use 2x8 and I would probably center them at 12", the extra cost is negligible and you end up with a more rigid platform. The short answer is yes, of course you can build a deck at 14x14 over that hole that is supported by footings and piers that are set inside that hole. But The next issue is the type of soil you have and its bearing capacity. I can't give you any guidance on that other than to give you an example of which you can get some ideas from and approach a local builder to confirm. If your new deck is 14x14 it will occupy 196 sqft. If you presume the dead load of the deck itself is 40 lbs/ft then the total load of the deck structure would be 7840 lbs. Now add the maximum weight of the spa which you say is 4000 lbs. Does this include people? Add more. What about other people walking on the rest of the deck or other object? If so, add some weight for that. Maybe another 1000 lbs? If so lets consider the total likely weight of 7840+4000+1000=12840 lbs. If you support this structure on 4 circular footings with 24" diameters, each having a surface area of 3.141 sqft, the total bearing surface area of the 4 footings is 12.56 sqft. To see what load will be imposed on the soil, do this: 12840 lbs/12.56 sqft= 1022.3 lbs/sqft. If you want a safety factor of 2x and you only want to use 4-24" dia footings then the bearing capacity of the soil would have to be 2044 lbs/sqft. I should direct you to the Deck Footing Calculator which is very helpful to play with various loading scenarios. So I hope that helps. Do check out the help tips under the "?" symbol for Soil Bearing Capacity as it will explain how to estimate your soil bearing capacity otherwise you will need to contact your building department or a local geo technical engineer who will surely now the soil in your area. Join in and write your own page! It's easy to do. How? Simply click here to return to Pools and Hot Tubs Forum.